“No rest for the wicked! Three early mornings allowed us to maximize the mileage on this 500 something cumulative km trek spanning two provincial parks. Skyline as a cross over hike was a fun and unique experience with 5 hikers from Skagit and 4 hikers from Manning enjoying more sunshine than drizzle (and just a flash of lightning) before meeting up at Mowich for an enjoyable evening together. 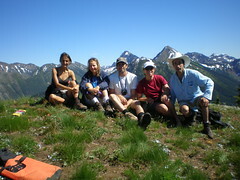 West of Mowich, Skyline does offer fine views of Ross Lake and the North Cascades. However continual views of Hozameen, endless peaks, valleys and the Lightning Lakes chain, kilometres of wildflower meadows, access to ascend Lone Goat and Snow Camp Mountain (a fine lunch spot enjoyed by both groups) is afforded by Skyline east of Mowich. Both groups also tackled a portion of the Hozameen Ridge trail 900 m west of Mowich (a spectacular ridge walk on a clear day). Reunited in Manning a dip in the river, some grub at the East Gate Diner, some refreshments from the General Store and cards at the Hamptons rejuvenated our band. Of note – still some water trickling at Mowich, but I was glad I packed in all my water. Bugs (particularly flies) are better than last year in Manning, but were enough of a nuisance (as proved by my swollen eyelid bite). The snow is ALL gone and flower season should hit full bloom in the next few weeks. The Silverdaisy trail is in fine shape, though easy to get side tracked and wander off in the beautiful meadows up top (pay attention and look sharp for the flagging). Silverdaisy makes you work for it, but the payoff of alpine meadows with a panorama of mountain views made for a very satisfied group. Mental or GPS breadcrumbs are useful for descent from the summit (easy to loose the route you travelled in on with little or no meadow footbed). The through and through hike may have shaved some time but navigation to Cayuse took effort and required GPS (lots of roads, lots of choices, little or no distinguishment on screen between active roads and now tree choked roads). An enjoyable adventure, but best (and more scenic) to just return via Sumallo Grove. Summary: Nine enthusiastic hikers – check! Two cars + two phenomenally dedicated drivers – check! Two through and through hikes completed- check! Several frosty shakes and slices of pie consumed. Nine content hikers. “An unforeseen situation and my paddle partner for the trip had to back out. Not one to back out of challenge or an adventure I went solo with words of encouragement. I think those words where you’re crazy, nuts or you’re going to get eaten by a bear. My GPS recorded 130 km round trip and 4 days 6 hours and hardest section was the last dock, ramp going to the campground. Shake my fist in the air at BC parks engineering department! “Definitely a place to go back to… when it’s less buggy. On the other hand, if you like to jump into pristine mountain lakes on hot summer days, it would be hard to beat this place. Some of us swam in five lakes over three days, and we passed by several more. Forest fires were on everyone’s mind but we made a conscious decision to go anyway, as we felt that this area would not be very dry, conducive to spreading fire, or particularly remote. A thunderstorm arrived quite suddenly in the hot afternoon, and we spent some time hunkered down in the forest to wait for it to pass. We sat on our packs while Michal explained how to perform CPR in case someone got struck by lightning, and I shared the previous night’s reading about how to survive a forest fire (Google it). The bugs were an inferno at the start of the trail and became merely horrible by the time we arrived at the Wendy Thompson Memorial Hut. We’d brought tents, but there was only one other nice couple at the hut, and lots of room. On Sunday morning we spent the better part of an hour trying to find a trail to the ridge and summit. Several trails leave the hut but seem to vanish, and I don’t know to what extent we should have been on-trail higher up. We eventually found our way to an upper lake using a route resembling what’s in Matt Gunn’s Scrambles book. That was just the start of a stunning array of small lakes in the Marriott Basin, set amongst meadows, boulder fields, and 360 degree views of surrounding peaks. Scrambling was not too difficult, but helmets would have been a good idea. We spent many happy hours exploring, and returned to the hut very tired. – the Hurley was rough – lots of washboarding, potholes and rocks – but still 2wd. – June’s Tyaughton Lake fire didn’t affect the drivability of the Tyaughton road but you do drive thru a bit of burnt forest. – The first km after the Tyaughton Creek FS campsite will give 2wd drivers a taste of the worst of the coming 20km or so – minor rutting and a waterbar going uphill. – 2wd drivers should stop in an old logged area just after an overgrown road to the east and then one doubling back to the west (sorry, no odometer reading). Immediately after this, the forest gets close and the rutting gets worse. You will be facing a 2hr road walk before the trail start. – We made it to road end in my Suzuki Jimny. – Mosquitoes were not too bad (i.e. not horrible) but horseflies came by the bushel-load (killed 5 with one slap) in the alpine areas to the west of Big Creek and stayed with us from about 9am – 7pm each day. – The Big Creek crossing was around mid-thigh (shorts will get wet); Tosh was about knee-height near Big Creek; an un-named creek about 2/3 up Tosh was mid-thigh and almost dangerously fast. Other creek crossings were lower but plentiful. – Saw little evidence of bears and with most big mammals sheltering from the sun during the day, only a handful of deer, some bighorn sheep and one moose. Wolf prints were plentiful but didn’t see or hear any. – Snow was at late-August levels. – Encountered only one guide-led horse trip and then a couple of the same wranglers a couple days later. No bikers or hikers. The information provided in these pages should not be taken as accurate, complete or up-to-date. You should check this information yourself. The reader is warned that it is unreasonable to rely solely upon the information contained in these pages. By providing this information, Wanderung does not assume any liability for the use of this information by our readers.